August 13, 2018 at 10:24p.m. Yo-Yo Ma spent Monday in the Mahoning Valley, meeting with community leaders and brainstorming ways to revitalize the area through the arts. 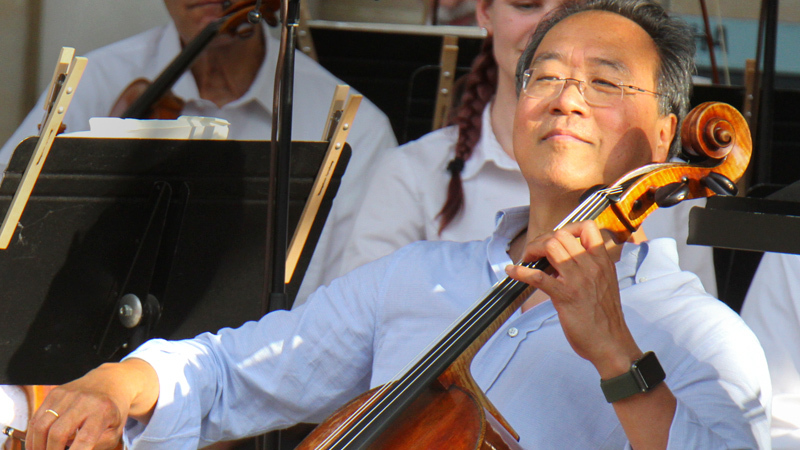 The world-renowned cellist came away so impressed with the Valley’s spirit and cooperation that he suggested the area could become a model for other communities. “If you’re going to fix things, you’ve got to fix them for everybody,” he said. Ma’s visit was part of Arts Across America, a program sponsored by the Kennedy Center for the Arts and other organizations. Its goal is to celebrate communities that are using the arts in their revitalization, and to help find ways to keep the momentum going. Ma spoke to The Vindicator at Warren Community Amphitheatre, just before his evening concert that drew roughly 3,000 people. He said it was a pleasure to see the unity that exists in the Valley. “All these citizens who are interested and committed and passionate about this is such a treasure,” he said. “There is a sense that everybody wants to see the same thing, a tremendous sense of collaboration, more than any other place. Ma took part in a strategy session earlier in the day that sought to identify goals for this region. The Mahoning Valley’s sense of determination and work ethic was a recurring theme. He cited Darrius Simmons, the Warren G. Harding student who is gaining national attention as a pianist and composer despite being born with three fingers on one hand and only one on the other. “He shows the kind of courage, the spirit that I think exists here,” said Ma. Ma made it clear that Arts Across America is not just a one-day affair. “We always say we’re happy to take a first meeting, but if nothing happens [interest wanes],” he said. Members of the strategy groups will get back together in 30 days, he said, to discuss what has been done and plan the next steps. Ma, who is the artistic director of the Kennedy Center, is bringing the Arts Across America program to 36 cities. The stops are intertwined with his touring schedule in which he is performing the six Cello Suites by Bach. The suites, he said, are known to provide comfort for people who are going through tough times. Ma talked about the late Fred Rogers, the children’s television pioneer who created “Mr. Rogers Neighborhood,” as an inspiration for his efforts. In the wake of the 9/11 terror attacks, Rogers was asked what adults should say to children. “He told them, ‘in a crisis always look for the helpers’,” said Ma. Solutions will come from communities, and only when leaders become interested in other disciplines. “You find people who are solidly grounded in one thing – faith, museums, music, legal, education – and then they get interested in something else,” he said. It is in this “edge,” he said, where disciplines overlap that solutions are found – much like musical innovation is found when musicians from different genres get together.